Contributing designers include Andreas Lund, Ara Thorose, Big-Game, Chris Wolston, FÄrg & Blanche, Faye Toogood, Front, Jean-Baptiste Fastrez, HAHA, Jack Rabbit Studio, Jaime Hayon, Jonas Wagell, JUMBO, Konstantin Grcic, Loic Bard, Müsing–Sellés, Pierre Yovanovitch, Sylvain Willenz, Talbot & Yoon.t & Yoon, Toni Grilo, Farg and Blanche. Cute and fleshy, sweet and soft, there is a growing movement to design furniture to be adorable and pleasant. 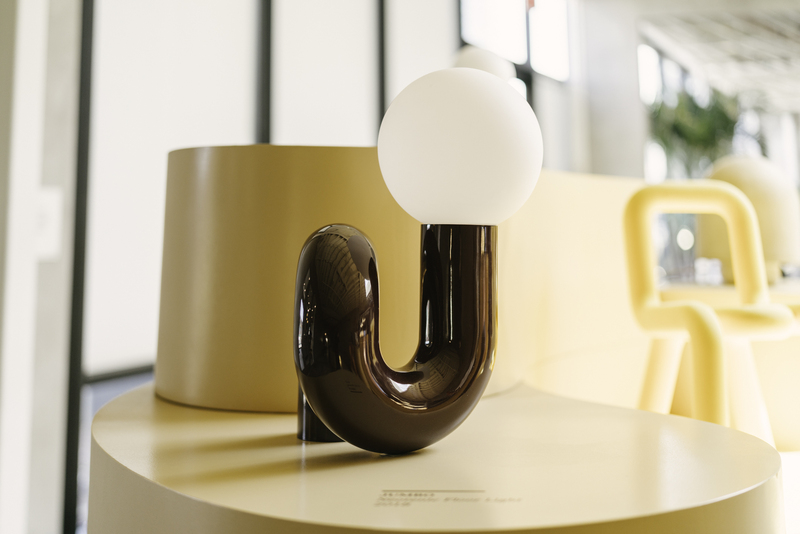 Abstract anthropomorphic qualities such as stout bases, round corners, and curved legs turn inanimate materials into objects of affection. 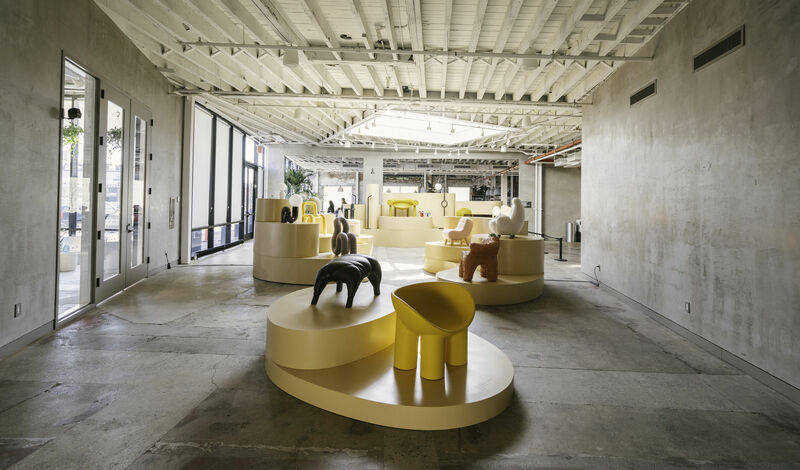 Justin Donnelly of Brooklyn based studio, JUMBO has dubbed this aesthetic as Neotenic, “possessing childlike features that elicit an emotional response.” Donnelly, along with JUMBO’s co-founder, Monling Lee, curated the current A/D/O show of “Neotenic” designs. United by their physicality, the chairs, lamps, and tables stand like a gathering of clean creatures, asking to be touched, stroked, and loved. The designers who contributed their works to this show, represent a wide range of manufacturing techniques, material approaches, and studio ethos. The diversity of their practices and locals exemplifies the far reach of the neotenic aesthetic. 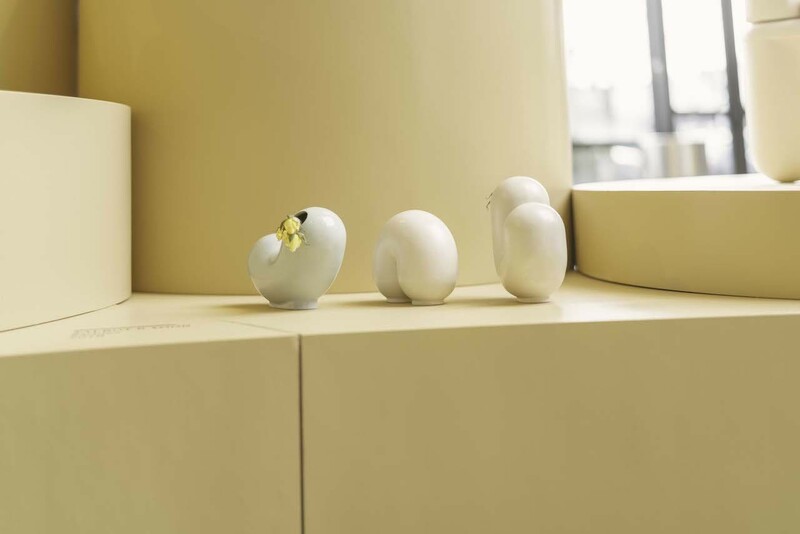 Talbot & Yoon, Kirbies - Talbot & Yoon describe their Kirbies collection as “three best bud vases to keep you company.” Charming and cute, they have a distinctly playful and almost mischievous character. Very neotenic. The New York based team enjoys making each object by hand and declares that they “want to provide the adult consumer with the same delight from the end product as we experience in the process of design.” Their work shows their experimental nature and objects such as amorphous gooey candles called Goobers or the tripod based First Tri Stools show their fun. Curators of the Neotenic Show, JUMBO’s Justin Donnelly and Monling Lee are leaders in the neotenic design space. Their most recent Neotenic Collection of objects incorporates the findings of their research on the aesthetic, “simple shapes, short thick members, soft edges, and a clumsy appearance.” They conclude ”the resulting form appeals to our biological imperative to nurture— to see ourselves in our surroundings and cherish the childlike.” Using this same tenant to outline the parameters for the show, they brought together misfits, childlike, and expectant into one united conversation. Like the Aballs Table Lamp their springy looking Floro Light, is made enameled clay and glass, playful but delicate, it is a toy for the eyes. New York based artist Chris Wolston creates energized fantastical pieces whose varied forms are bound by their celebratory energy and material exploration. 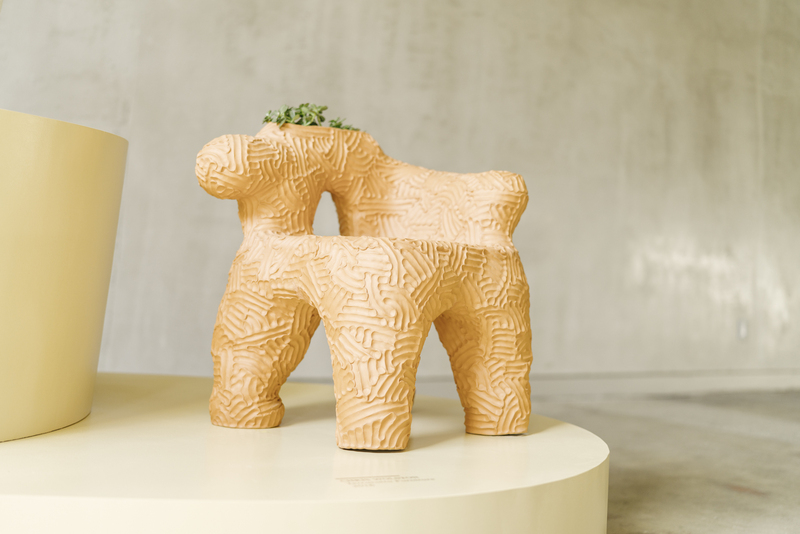 From his collection “Body” in which the chairs have literal human shaped feet and are formed by metal figures joined together to his collection “Terracotta Furniture” where chairs double as lopsided planters, his furniture has personality. This is the only Terracotta piece in the show, but even with its rough hand-shaped form, it is comfortably neotenic.